A sluggish night for several networks. 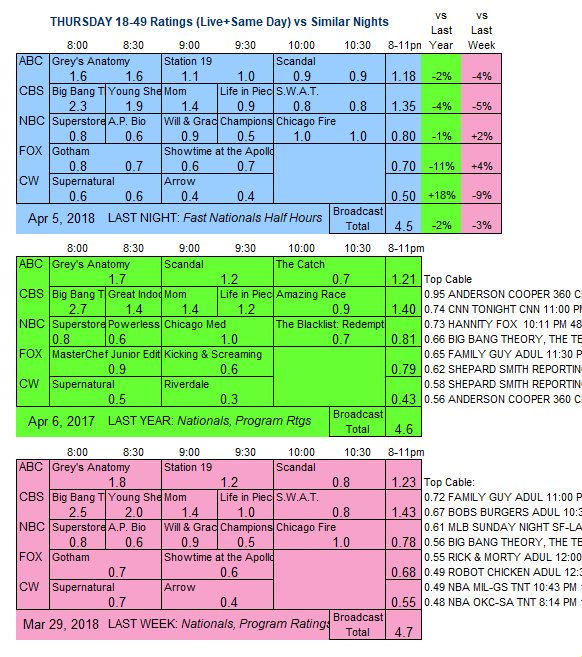 ABC: GREY’S ANATOMY fell 0.2 to 1.6, and STATION 19 lost 0.2 to 1.0, but SCANDAL rose 0.1 to 0.9. 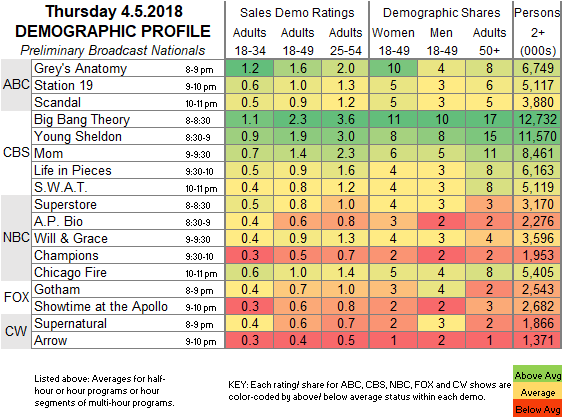 NBC: The entire line-up was steady, with SUPERSTORE at 0.8, AP BIO at 0.6, the season finale of WILL & GRACE at 0.9, CHAMPIONS at 0.5, and CHICAGO FIRE at 1.0. CBS: THE BIG BANG THEORY dropped 0.2 to 2.3, YOUNG SHELDON slipped 0.1 to 1.9, MOM held at 1.4, LIFE IN PIECES lost 0.1 to 0.9, and SWAT stayed at 0.8. FOX: GOTHAM (0.7) and SHOWTIME AT THE APOLLO (0.6) were steady. CW: SUPERNATURAL fell 0.1 from last week’s Scooby Doo episode to 0.6, and ARROW remained at 0.4.